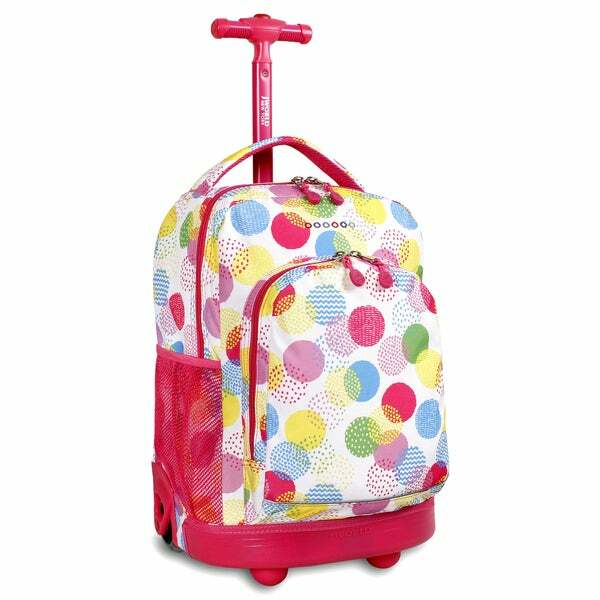 The Sunny rolling backpack is sure to hold your personal belongings and keep them safe anywhere you go. Featuring an adorable pink polka dot design, this pack is both functional and fashionable. My grandchild loves this backpack. It hold everything she needs and rolls very good. The description was accurate and I would definitely recommend this to a friend. This girl's backpack is very cute. It is the perfect size for a little girl in kindergarten or maybe first grade. There is plenty of space for her books and she loves the little places for her pencils. Overall, it's a pretty good value. Bought this for my 8 year old who has used it for over a year now and it is still in good usuable shape including several airplane trips. My daughter loves it third bag but looks sturdy hopefully it will make it until summer. "Would this be suitable for a 5 year old as an overnight bag"
Yes, the product can be used for many occasions such as an overnight bag, a weekend trip, and daily school usage.